Clearly there is a lot of buzz around iPads in schools at the moment. You can’t log on to the Web without reading about another school or entire district or department investing massive coin in a sparkling set of the Wonder Tablets, excited that they will cure all the ills of the current education systems around the world. From reading my blog, you would be no doubt convinced that I am very much in this Pro-iPad camp. Make no mistake I am. However, no matter how versatile and potentially powerful a product the iPad is, it is merely an extremely expensive placemat without creative, well planned teaching behind its use. Before committing to an iPad implementation of any size, schools need to thoroughly think through how these technological marvels are going to enhance the teaching and learning process. The kind of shift in learning the iPad (and other tablets) can initiate is dependent on good teaching practice and preparation. The iPad has an app for just about anything. Students will be able to work out how to use the app. They do that quicker than us. As teachers, its our responsibility to show them what to use it for. It’s why we have to think of what we want them to do as learners, not what can the iPad do. We have to make the iPad suit the learning, not make the learning suit the iPad to justify having it. So think of the skills you want your students to develop and then work out if the iPad can improve that skill. If it doesn’t, don’t use it. So let’s look at how we have gone about teaching up until now and examine how the iPad can fit in to our current programs. In today’s post, I’ll focus on how we can enhance note taking skills using the capabilities of an iPad compared to what we’ve done in the past and what we might do if we don’t think how the iPad could be used. I’ll be following with other areas one the coming weeks. With the aid of the 20th century’s very useful tool known as the highlighter, we have spent years highlighting key words, squashing in related notes, scribbling indecipherable diagrams and drawing arrows from one point to the next. We would then share our ideas one at a time recording them on the board, or maybe record them on big sheets of paper collaboratively until we run out of space or time. Possibly we organized our thoughts on a mind map or some other sort of graphic organizer. Eventually the sheets of paper or boardwork get replaced by new work and your discussion gets filed under ‘done and dusted. The good note takers and memorisers get something out of it and the rest move on to the next thing without any real reflective learning taking place. We hand the student an iPad, he opens up a PDF or iBook version of a document, chapter or book, highlights some key words using the program provided, write some notes in another app, draw a diagram or download an image from Google and save it for later discussion. In this scenario, you can record and store more information, have a greater variety of visuals, the ability to retrieve information at a later date and have the greater short term engagement resulting from using the latest tech. However, there is no real shift in the learning and teaching model here from the pre-iPad model. Same work, different set of tools. This is how I envisage the iPad creating a major shift in note taking. Yes a lot of it can be done with regular desktop computers and laptops, but the unique touch interface and portability of the iPad makes it more accessible and practical. Using Notability/Goodreader/Skitch/Evernote/iBooks (depending on the purpose), import the PDF, RTF, epub file or the Notability note from another source into the app. Use the highlighter and annotating tools to highlight keywords and phrases, underline or circle or arrow sections of text. (So far same as old system.) The shift is the ability to look up meanings with inbuilt dictionary, edit annotations, add extra notes from others during collaborative discussions without running out of room, take photos of other diagrams by other students and annotate them, add web clips of relevant websites that are searchable and accessible without leaving the app and record conversations. The notes can be saved, shared with others so they can add further comments, notes, diagrams etc. During whole class or group discussions, students and teachers can record the discussion in Notability and take notes or add photos, diagrams, web clips or handwritten notes during the recording. Later on, these notes can be reviewed and clicking on a note added during the recording will locate section of audio relevant to the note. This entry was posted in iPad, iPads in Literacy and tagged annotate, collaboration, engagement, iPad, note taking, purpose, recording, review, special needs, support, web clips by mgleeson. Bookmark the permalink. Thanks Viv. Really important to match the tool with the learning. Sometimes it’s qUicker to grab a post it note than search through a computer/laptop/iPad to take a note. But if preparation has been done, the tech tool can be a game changer. For pure note taking with range of AV options, Notablity and Evernote are my go tos. But for effective annotation it’s GoodReader and Skitch for me. Thanks for your post. I agree that we still have a long way to go in really thinking how to use iPads in teaching…it still takes me some time to organize my own annotations taken on iPad…I have had some success with collaborative notes using Google docs and im thinking about something like iCyte or diigo. Thanks Kate. My note taking is probably more routine than my annotations at the moment as well. I recommend Diigo. Get the Diigo bookmarklet installed on your browser and you can highlight, annotate and share websites. Should have mentioned it in the post. Thanks for mentioning it. This is a fine post. The technology appears revolutionary because people who want to change the way education takes place are using changes in technology to change our thinking around holistic approaches to learning, self directed learning and 21st Century skills. Which is why a posts on how to improve note taking doesn’t quite reflect what is really possible. What the iPad offers is a new way to sift, sort, think and manage information. The ability for mobile devices to promote and engage children in searching and identifying information in new ways goes way beyond advanced note taking. In fact, good information management makes the need to take notes in the way described obsolete. The mobile device in the classroom offers the entire world of information in a portable screen. How can teachers improve learning by teaching new skills that maximise what the devices offer, not try to fit old skills into a tool that offers education a transformative moment. Again, if the ability to shift educational structures is there. It is about what people do. Not the tech. Thanks for the thought provoking reply Dan. You are right. Lots to think about for my following posts. Want to consider real shift in contemporary teaching and learning in 21st century. Our minds are still stuck in the 20th in many ways and in a way the reluctance to embrace the power of technology is because we don’t understand what it can help us do. I’m not there yet. I suppose the note taking I talked about was still teacher driven in that the information and the purpose was provided by the school environment. It should be about the children making their own decisions about searching, sourcing, collaborating, curating information and then how they can access it intelligently and seamlessly. Apps like Zite Magazine maybe or social bookmarking sites like Diigo? Fascinated by your insights. Checked out your sites Project Synthesis and Digital4life. Would like to stay posted on developments. I shared your site with my administrators. Excellent article. I wrote a grant, got an iPad cart for Art & Music depts. May also be used by other depts. (large public HS) I want teachers to submit a lesson plan before checking out the cart. Trying to have this be a policy at our school. Will also be a good way to track usage. And we can share these and give feedback to each other. There’s resistance to this idea. The lesson plan is one page. I just want teachers to have a plan before they check out the cart. Not too much to ask for if your checking out about $20,000 of equipment. Ms. Reynolds-Fefles, thanks for the response. One of the benefits of starting this blog this year has been the replies I’ve received. They have given me as much food for thought as my ideas have to the readers. I agree there has to be some accountability from teachers to justify having the iPads. We want them to be a different use case than the laptops or the desktop computers. We have to challenge teachers to think how we will use them for something more than what computers have been in the past. If they only get used as alternative word processors or ebooks the investment wasn’t worth it. Great conversation re iPads. They are only as good as the teachers who teach w them. Luv idea of requiring a lesson plan prior to checking out the cart. And it’s a conversation any school investing in iPads needs to have. I’ve taught throughout the whole computers in schools era and I believe we never got it right. Don’t want the same thing happening in this new era of technology – and I’m not talking just about iPads. Technology should be the game changer in Education but it won’t be if we just keep adding them to schools without a plan. A great article we are doing lots of work ourselves with iPads/iPods/hand held learnng etc and this sums up some of the key issues we have faced this year. A great blog, keep up the great work and be sure to look at some of the work we are doing on my website. Thanks Phil. Checked out your website. Looks like you’re on your way to transforming PE with technology. Will get my PE teahcing friends on to your site. while every use of an iPad in a classroom might not be transformative… i do not want children using 18th / 19th /20th century tools while 21st century tools are available. in my classrooms i used watercolour pencil crayons when they came out, desktop computers.. then laptops, the net via telephone cables, and wi-fi. chopping the textbook budget will pay for these new tools. Well said, James. Don’t expect everything to be revolutionary. But we are into the second decade of the 21st Century. Time to work with the tools our students were born with. You are so right in everything you shared. The point of “Technology should be the game changer in Education but it won’t be if we just keep adding them to schools without a plan.” is crucial. At the school I work at which is Title 1 we get money for computers, but there is no plan or training involved in how to properly use them to “change the game.” Therefore, technology is not being utilized properly. More like using a screwdriver to hammer nails. 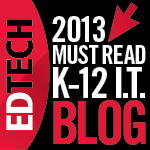 I have recently gone back to school to learn about technology in order to enhance the learning process. Unfortunately not enough teachers or administrators are on board yet. Thanks for the post it is excellent. Thanks Harley for the support. There are of course schools out there getting it right but we still need a lot more like you going back to learn to make a difference. As long as you’re learning how to teach with tech, not just about tech. Good luck in your studies. so happy to have found your blog! i am very please to be part of a school that is moving towards a bring-your-own-ipad model for students. however, your blog post title captures one of my main concerns. there is so much to be said for thinking about “what we want [students] to do as learners” with or without technology. purposeful planning is a first step in good teaching. the biggest obstacle is creating the plan that will support teachers in making thoughtful choices about when/how the ipad can enhance learning. looking forward to more thoughts on this as i continue to develop my own. The big obstacle is probably that we’re trying to improve everything in education at our own schools and we can’t fit it all in. Literacy is important. Maths is important. Inquiry and critical thinking is important. Social welfare is important. We somehow have to be creative and get Technology embedded in these areas during planning and staff meetings because we can’t fit everything into a finite number of meetings. 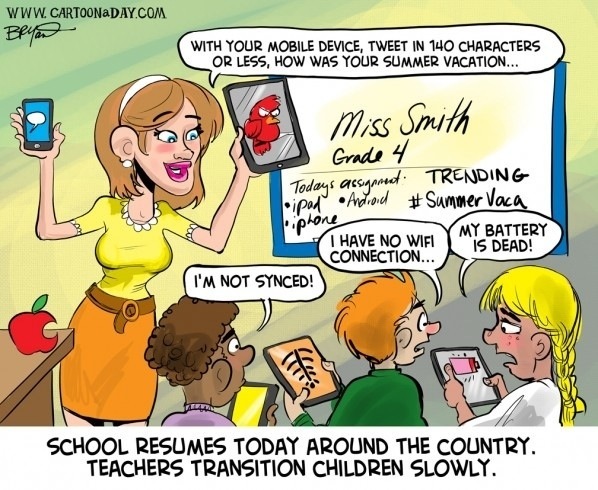 I also think teacher training at University needs a major shakeup. All I had 26 years ago was Turtle Graphics so my generation’s trainers are probably excused. Today, though, new teachers shouldn’t be walking into schools not knowing what Prezi is, not knowing how social bookmarking and content curation sites work. They should be teaching the oldies about online collaboration and interactive posters during planning time. Graduates should know how to use online polls and charting tools in Maths and that Skype is not just for talking to your uncle overseas. We’re never going to catch up with technology with the time we have at school. Pre teaching training and Personal improvement has to happen. Loving the blogs – really helpful getting me to focus on how this technology can can have an impact on the teaching and learning in the classroom. It’s clear to me that children are engaged and inspired by iPads, (we had some on loan for 3 weeks), but getting the ‘plan’ right is my next step. So, if I’ve got this right, the challenge for me is making sure that the iPad is improving children’s skills and then these skills once developed can be used to improve their own learning and creativity? Big decision … iPads or a combination of iPods and iPads? Visiting a school tomorrow, where each child in the class has their own iPod – will be interesting to see how they impact on children’s skills. It’s about identifying what those skills are,too. Are they tech skills you’re developing or numeracy,literacy, critical thinking, researching, collaboration, etc. Know hat the focus is, monitor how the learning tool develops the skill and keep using it if the child improves. Would like to hear about what you observed at the 1:1 iPod school. The larger issue: iPads, computers, Internet, tablets need to become an essential part of every single classroom throughout the school day because these are as essential to learning as the pencil. This is just the reality of where we are and what the kids must have in order to learn and learn to learn. The pencil can’t improve learning without good teaching, but man . . .it would stink not to have pencils. Consider the iPad, tablet, computers and most importantly the Internet as the pencil we are all busy debating what to do with. Just do something and now. Thank you for the stimulating article. Thanks for feedback Michelle. It’s a nice analogy, the pencil. It got a good run last year as an example of the new tool that changed things in. Th past. It’s true we need to look at technology as just tools in the class room to help us learn. Just wish it was as easy to use as the pencil. Checked out your post on mind mapping. Good post. great points–our middle school has just purchased iPads for the teachers with plans for the 6th graders to begin using them next fall (older grades will have MacBooks)–although we are all very excited it really helps to get guidance from those in the know! The positive is that you know when you’re getting them and have time to plan for their purpose and use. I have to say I was very impressed with how iPods can be used in the classroom. Maybe the hype of the iPad has over shadowed its smaller relative – the iPod. As a cheaper alternative, with the same functionality as the iPad (apps, camera, video, internet, voice recording etc), seeing them in action in a classroom setting was a real winner for me. The obvious main difference – the screen size, didn’t seem to restrict the children’s creativity at all, from searching the internet to creating keynote presentations with sound, pictures and text. One particular example that I saw of children’s work really stuck out (word don’t do this justice), but using iMovies she had created a presentation on the the horrors of the holocaust, added pictures and text with a soundtrack as part of her work in class. After school she took the iPod home, interviewed her grandmother and got her mother to comment on the iMovie. Very powerful! Yes, there is certainly nothing wrong with having iPods as tools. As you mentioned, the video, audio, communication aspects are as useful as the iPad and many apps are useful on both devices. You can definitely make good videos, photo sideshows and the like. The iPad just has more options and specific apps because of its screen size. Ipads are great tools for teaching and learning when they are the right tool for the job. They will only improve learning when the implementation is driven and supurported. We have 4 sets of pads and have provided planning support and a 10 min input at the start of every staff meeting to show a new app and generate ways of using it. Had a really positive impact in my school for literacy and maths. WIll be launching more into science soon. Great to hear of planned support and staff meeting time dedicated to introducing apps. Will try to implement that at school. Thanks for the tip. I think it’s a great idea to bring iPads into our education. It will be easier to stay and be organized, help students save time, and it will also have some great apps for us to use. I always lose important papers and find it hard to keep organized. Now with iPads it will easier to stay organize. The iPad has folders to categorize your different apps. It also stores your notes in a safe place, so they won’t get lost. The iPad also has many great apps. Using educational apps, will enhance our learning. According to apple.com the Evernote app, is a great app to write notes. Another fantastic app according to apple.com is iFlashcards. The app iFlashcards is very helpful for studying. On this app you can make flash cards based on what test you have to study for. And you won’t waste time making flashcards out of those index cards that are easy to lose. Using iPads at school will also save time. Instead of making many visits to your locker, you can just carry around everything you need in your iPad. The iPad is also light weight so it’s easier to carry than all of those binders. The iPad also saves you time by having your homework store in there so you wont lose it. And you won’t waste time finding it if it gets lost and worry about getting a bad grade. This article hits home when thinking about how cool our IPad device is but how we need to start with student needs first. Right now I use it truly as a place to take notes and check email – very similar to my laptop or paper and pencil of old. I am realizing that my mindset needs to change and my knowledge of the IPad’s capabilities needs to grow, simultaneous with figuring out what my students really need to enhance their learning experiences.